The Best Massage Chairs For Back Pain - Are They Worth The Money? The Best Massage Chairs For People With Back Pain - And Are They Worth The Money? A luxury item? Sure. But do they help your tight and aching back muscles to relax? You bet! So discover the best massage chairs for back pain and if they are worth the expense here. Now you've probably seen massage chairs in shopping malls and airports before. Hell, you may have even had a go on one yourself. Am I right? And if you have then you'll know just how relaxing and soothing they can be. As just a few minutes can really loosen you up and take away the stresses and strains of the day. However, while people love the experience of sitting in a full body massage chair, very few consider buying one for themselves to use at home. And the reason for that is totally understandable, as massage chairs are bloody expensive! So it's the hefty price tag that puts them out of reach for most of us. But for those that can stretch to owning their own massage chair, I thought I'd put together this guide of the best ones on the market for your back pain. Because while being expensive, they are also a great way to relax both your body and mind at the end of a long day on site. And they work fantastically well for loosening up your tight and aching back muscles. So read on and I'll explain just how these massage chairs work and the health benefits they bring. And I recommend the following massage chairs for anyone with back pain. Best overall massage chair for back pain - Luraco iRobotics 7 Massage Chair. 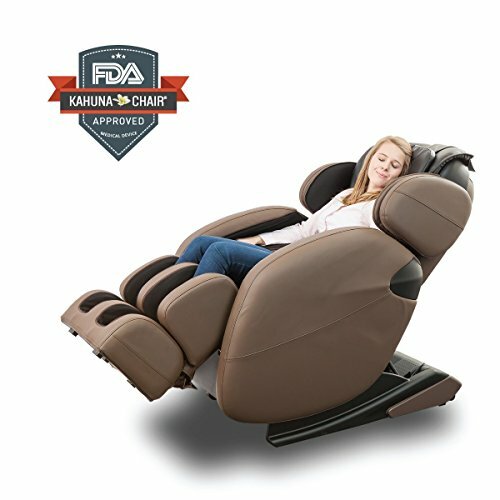 Best mid-range massage chair - Kahuna LM-7800 Shiatsu Massage Chair. Best value massage chair - Kahuna LM-6800 Yoga Massage Chair. I'll also give you a buyers guide that lets you know what you should be looking out for when deciding to buy a massage chair. And I'll end with the all important question.....are they worth your hard-earned cash? How Does A Full Body Massage Chair Work? Massage chairs aim to emulate the feel and motions of a masseuses hands and fingers to give you a full body massage experience from the comfort of your own home. This will help you to relax and relieve stress and muscle tension and they do this in a number of ways. Firstly, there are mechanically motored nodes and rollers within the chair that apply tapping, vibrating, rolling and kneading motions to your sore and aching muscles. And most high quality chairs also come equipped with airbags within the seat that inflate and deflate in a rhythm that also provides a nice massage. There is usually an option to add heat to the lumbar section and legs, which allows your muscles to relax more deeply while you are being massaged by the nodes and rollers. And there are generally two massage styles that massage chairs tend to emulate. The most common one is the Swedish massage style which will give you a gentle and relaxing massage by kneading your muscles gently in circular motions. But the massage chairs that are better for your back pain come with the option of a Shiatsu type massage. As a Shiatsu massage chair is more intense, as the rollers and nodes work to press against the various acupressure points across your body. Giving you a deep tissue massage that relieves muscle tension and encourages tight muscle knots to release. How Easy Is It To Use A Massage Chair? So how do you use a massage chair? It's mostly a case of just sitting back and relaxing. As the chair will put you into a comfortable reclined position that takes the pressure and strain off your lower back (if they are really good they will have a zero gravity option like the 3 chairs I've featured here). Then using the remote control you simply choose the type of massage you want from the various pre-programmed massage settings. This will set the nodes and rollers to work and move in a certain way depending on which type of massage you've selected. And you can also manually adjust the intensity so you can get it just right for you. Which is great, as you can choose to get deep into tough to reach muscle knots or just give yourself a nice, gentle and relaxing massage depending on how you're feeling. Also most high quality chairs will automatically adjust themselves to fit your height, weight and body dimensions. They do this by using infrared body scanners which then sends messages to the microprocessor to adjust the position of the rollers and nodes to fit your specific size and shape. And this not only ensures that these nodes and rollers will be able to focus on the exact areas you need massaging. It's also a great feature if more than one person will be using the chair, as it will adjust itself to fit each individual. So what exactly can a massage chair do for you and your back pain when used regularly? Well the answer to that is very similar benefits to those that you would get from getting regular professional massages. Which is great because massaging your back is the best way of getting rid of tight muscle knots and blockages that may be causing you pain. As massaging these areas of tight and contracted muscles encourages them to release. And by releasing them your blood flow to the damaged muscles increases. which helps to deliver the oxygen and nutrients they need to repair and heal. It also allows trapped waste and toxins that may have been causing you irritation and inflammation to be flushed away and eliminated. Which will lead to less pain, tightness and tension in your body. Reduce tension in your muscles making you more flexible and giving you a greater range of motion. Keep your body well-balanced which prevents any muscle imbalances from developing. Help to improve your posture by relaxing your muscles, which relieves pressure on your body throughout the day. Lower the levels of pain you feel in your muscles and joints by stimulating the release of endorphins which are the body's natural painkiller. Help you to relax your mind too, which allows your muscles to rest as stress and tension is usually held within your body. This will also help you to get a better night's sleep which is where your body can heal and repair itself. Lower your blood pressure and boost your immune system. Which all makes time in a massage chair time well-spent. And there are plenty of different massage chairs for you to choose from. However, I didn't want to overload you any more than is necessary, so instead I've chosen 3 great massage chairs at different price points so you can choose the one that best suits you. As all 3 are great for helping you to relax and relieve your back pain. But obviously the higher up in price you go the more features and better quality massage experience you get. So let's start with my top choice which is the Luraco iRobotics 7 massage chair. 5 memory settings to save customised massages. FDA, UL and CE listed. What's Good for the Back? The dual rollers provide a strong massage from your neck to the top of your buttocks. While the zero gravity position helps to relieve pressure on your spine. The 3D roller system allows you to vary the massage intensity on your spine. And the heat option allows your back muscles to relax more fully. The body stretching feature helps to decompress your spine. This chair comes with a pre-programmed Shiatsu massage option. 3-year warranty covering parts and labour plus in home repairs. Additional 2-year warranty for parts. 60-day free return period (you just pay for the original shipping costs). The Luraco iRobotics 7 massage chair comes with just about every feature you could think of in a massage chair, which is why it's priced at the high-end of the market. For starters there are three different elements to the massage you get from this chair: rollers, airbags, and heat. Firstly the dual rollers run on an S-track between your neck and the top of your glutes to give your back a full massage. ​And they work on a 3D system meaning they move into and away from your body at various points to mimic the natural S-curve of your spine (you can adjust the intensity to suit you too). Then comes the 100 airbags built-in throughout the chair that inflate and deflate to massage various areas of your body. These work great, especially for your shoulders, legs and calves. And the full body heat option (with 5 intensity levels) in the feet, seat, and back will help to relax your muscles further and allow you to get a deeper massage. There is also a zero gravity option with this chair where at the touch of a button the seat is tilted at a 30 degree angle with the seat and chair at a 120 degree angle to each other. This places you in an optimal position where the weight and pressure is evenly distributed across your body. Which relieves any strain on it and puts you in the perfect position to get a deep and soothing massage. The big advantage of the Luraco iRobotics 7 massage chair for people with bad backs is the strength and intensity of the massage it gives you. As the dual rollers are powerful enough to really work deep into your muscles and get right into hard to reach muscle knots. This gives you the best chance of releasing tight muscles and becoming looser and more comfortable in no time. The pre-programmed Shiatsu massage setting in this chair is especially great for doing this. Also the 3D roller system ensures your lower back, thoracic spine, and neck will all get a firm and consistent massage. And you can adjust the intensity of the rollers and their position if you feel like it's getting too strong for you. The zero gravity position this chair puts you in is great for relieving pressure on your lower spine. And it will also improve your circulation, which will help to deliver oxygen and nutrients to your back muscles to allow them to heal and repair. Also the airbag system in the seat is brilliant, as it introduces a swivel and rotation into your hip muscles which gets your lower back moving and helps to decompress your spine. And there's a back stretching feature that will help your spine to decompress even further. While the full body heat option in this chair allows your back muscles to relax more fully as the rollers work their magic, which lets them go deeper. However, the only down point for me is that the rollers run on an S-track and not an L-track. This means that they only run between your neck and the top of your glutes. Whereas on an L-track the rollers will continue on through the seat area to work your glutes, piriformis muscle, and hamstrings too. Which is great as all these muscles can become tight and tense when you suffer from back pain. But it's not a deal breaker, as the airbags in the seat will still give these muscles a good working over. As you can see from the video above, using the Luraco iRobotics 7 chair couldn't be easier. Because as soon as you sit down the full body scanner will get to work on adjusting the roller positions to match to your body dimensions for a truly customised massage. ​And once this is done it will automatically start on one of the pre-programmed massage settings. So there's nothing you need to do unless you want to choose a different program. And if you do there are 9 programs to choose from, so you should be able to find one that is right for you. You can also easily customise the massage so it has the exact positioning, strength and intensity you desire. And there are 5 memory slots so you can save your customised massage settings to use for next time. This is especially helpful if more than one person will be using the chair. And the touch screen remote control makes this really easy to do. Provides a strong and intense massage to help to relax and release your sore and aching back muscles. Has 3 forms of massage (rollers, airbags, and heat) that work your body simultaneously. The 3D roller technology allows the rollers to adapt to the natural S-curve of your spine. While the advanced body scanner customises the massage to the exact dimensions of your body. The zero gravity function evenly distributes pressure across your body taking away any strain. While the full body heat function deepens relaxation. The mechanical foot rollers are a massive bonus! And the chair is easy to operate using the touchscreen remote control. It's suitable for larger people (up to 6' 7" and 300lbs). And has a fantastic warranty and after-sales service. Having an S-track roller system rather than an L-track means the rollers can't massage your glutes and hamstrings. The built in speakers aren't of the best quality. The price tag means it's a big purchase. I really like the Luraco iRobotics 7 massage chair and think it's ideal for helping to relieve your back pain. As it provides a really strong and targeted massage that can unlock even the hardest to reach muscle knots. It's outstanding for helping you to relax too, with the 3D rollers, heat, and airbags all working their magic. And it comes with so many cool features that they have covered nearly every possible base. So while this is the most expensive chair in this review, if you are serious about getting a massage chair as a long-term investment in your health then this one is definitely worth consideration. 4 different zero gravity settings. Heating option for your lower back and legs. The L-track rollers mean you can massage your glutes and hamstrings as well as your back. Although quad rollers are not as strong as dual rollers, but they still give an intense massage. The 2D system means you can't manage the intensity on your spine as well as with a 3D chair. But the zero gravity positions will help to decompress your spinal discs. The heat option in the lumbar region allows your muscles to relax more deeply. And the auto-programs are based on Shiatsu massage therapy, which is great for back pain. 2-year warranty covering parts and labour plus on site repairs. 30-day returns policy, however comes with hefty charges. The Kahuna LM-7800 Shiatsu massage chair comes with features that you might only expect to see in higher priced chairs. For instance, just like the Luraco iRobotics 7 massage chair this one also offers 3 different types of massage simultaneously (rollers, heat and airbags). And this chair also comes with rollers in the foot area so you can get a nice foot massage too. The quad rollers in this chair run on an L-track from your neck right down to your thighs. However, the 2D roller system is not as intuitive as the 3D roller system on more expensive chairs, making the massage a little less intense and consistent along the spine. In total there are 36 airbags throughout the chair that also work on massaging your whole body. And this chair has 4 different zero gravity positions to choose from, so you can find the ideal reclined angle that suits you the best. There is also the option to add heat to the massage with this located in the lumbar area of the back of the seat and in the legs area. However, a couple of drawbacks are you can't adjust the temperature and you have to heat both areas at once rather than just focusing on your lower back. The Kahuna LM-7800 chair is capable of giving your back a really strong and rigorous massage, which is great for releasing tight muscle knots. And a big advantage of this chair is the L-track that the rollers run on. Because where an S-track will only run from your neck to the top of your buttocks, an L-track continues on through the seat to your thighs. Which means your glutes, piriformis muscle and hamstrings also get a lovely deep massage. And this is great as when you suffer from a tight and painful lower back these muscles also get really tight. So by massaging and releasing them they are better able to support your back, so you are relieving pressure on your back too. The quad rollers in this chair will give your back a strong massage, however they are not as powerful as the dual rollers in the Luraco chair. But there are 4 great Shiatsu massage programs already loaded for you to choose from that will do your back the world of good. One is called 'yoga stretching' and this one is great for decompressing your spine and relieving tension. And another thing that is good for decompressing your spinal discs are the 4 zero gravity positions which put your body in the optimal position to relieve pressure and strain. Also the two airbags in the seat work to twist and rotate your hips, getting some movement into your lower back. Which all make this chair a really good choice for people with back pain. The Kahuna LM-7800 is a really easy chair to get started with. As firstly it doesn't need much in the way of assembly, so you should be good to go almost straight out of the box. And there is a smart body scanner that allows the chair to automatically adjust the positions of the rollers to fit your size and shape. It also comes with 4 automatic massage programs built in (yoga stretching, active yoga, refreshing and dynamic sports). But if none of these suit you it's easily customisable. As both the rollers and the airbags have the choice of 3 different intensity settings. And you can also adjust the roller positions and the time of the massage (up to 30 minutes). The only problem is you don't have the option to save these settings, so you'll have to manually adjust them each time. But it's fairly easy to do so using the LCD remote control, which while not as easy to use as the touchscreen one on the Luraco chair, is still not going to pose you too many problems. Provides a strong massage for your tight back muscles. The L-track system is great as it runs from your neck to your thighs. Comes with 3 different forms of massage that work together (airbags, rollers, and heat). Has 4 Shiatsu massage based programs that are great for people with back pain. Has a smart body scanner so you get a massage customised for your dimensions. You can choose from 4 different zero gravity positions. The foot rollers give you a reflexology treatment. The quad rollers are not quite as intense as dual rollers. There's no way to save your settings after you customise the massage. You can't adjust the temperature of the heat setting or isolate it to only one area at a time. The Kahuna LM-7800 massage chair is the best one in the Kahuna range for providing a strong massage for your back in my opinion. As having the L-track system is such a big bonus. Because you can also relieve tension in your glutes and hamstrings which will help you to stay flexible and supported. And the 4 Shiatsu massage programs are great for your back and work well to stretch, massage, and relax your body. It's also a nice looking and comfortable chair that doesn't take up a load of space in your home like some other chairs can. ​So if you're looking for a chair that can give you a deep massage in the mid-level price range I'd thoroughly recommend this one. 3 different zero gravity settings. Although quad rollers are not as strong as dual rollers, but can still give you an intense massage. But the yoga stretching program is great for stretching out your spine to relieve tension. The zero gravity positions help to decompress your spinal discs. While the heat option in the lumbar region allows your muscles to relax more deeply. The auto-programs based on Shiatsu massage therapy are great for back pain. 1-year warranty covering parts and labour plus on site repairs. 3rd year structural framework only. This is the second chair from Kahuna that I've included in this guide. And the LM-6800 deserves to be here because it has so many good features that make it a great value massage chair. Again there are 3 different types of massage going on simultaneously (rollers, heat, and air bags). And just like the LM-7800 chair it also has quad rollers running on an L-track system from your neck right down to the top of your thighs. However, this chair doesn't give quite as strong a massage as the LM-7800 so it may not be the one if you want to go really deep and intensive. As the 2D roller system here will make the massage a little less intense and consistent along the spine than in chairs with a 3D system. But this chair does come with rollers in the foot area which is a nice touch at this price level (although some users have found these rollers a bit too strong for them). The 3 different zero gravity positions (which you can change at the touch of a button) allow your weight to be spread evenly, releasing pressure and strain from your body. And there are 25 airbags throughout the chair that work on massaging your whole body. Although again they are not quite up to the levels of the ones in the LM-7800. Although the heat function has the same problem as in the LM-7800. In that you can't adjust the temperature and you have to heat both your legs and back at once rather than being able to focus on one area at a time. The Kahuna LM-6800 chair won't give you as strong a massage for your back as the other two chairs featured here. But it does have a couple of great options that will really help you. Firstly, the rollers run on an L-track which means you get a massage right from your neck down to your hamstrings. Which allows you to keep your glutes, piriformis muscle and hamstrings flexible and loose and able to support your back. The quad rollers in this chair will give your back a strong massage, however these are not as powerful as the dual rollers in the Luraco chair. But there are 6 Shiatsu massage programs already loaded for you to select which are great for your back. These are marketed as 'SH-Chiro' and aim to give you a similar experience to what you'd get by visiting a chiropractor. As they are all designed to decompress your spine and restore the natural energy flow along your whole spinal column to keep you healthy. ​And the best of the bunch for your back is one called 'yoga stretching'. As this one will pull your body around by stretching out your legs and back, which is great for releasing tension and improving your flexibility. And the 3 zero gravity positions will also help to decompress your spinal discs and relieve pressure and strain on your back. Finally, the heated lumbar region will help your lower back muscles to relax more deeply while also increasing blood circulation to the whole area. Which delivers oxygen and nutrients to your damaged muscles to allow them to heal and repair. So while this chair doesn't give the most intense of massages it still has plenty of features that will do your back the world of good. There is a bit of work involved in the assembly of the Kahuna LM-6800 as you can see from the video above. ​But once you are up and running it's a piece of cake to use. As there is a computer body scan once you sit in it that allows the chair to automatically adjust the positions of the rollers to fit to your exact size and shape. And it comes with 6 automatic massage programs built in which can be selected at the click of a button. ​You can also customise these programs as both the rollers and the airbags have 3 different speed and intensity settings. But once again you don't have the option to save these settings, so you'll have to manually adjust them each time which can get a bit annoying. The remote control with this chair also has a bit of a learning curve to it but you should get the hang of it quick enough. However, one thing to note with this chair is it may not be suited to taller or heavier people. As the recommended weight limit is only 220 lbs and you may struggle to fit into it if you are north of 6 feet tall. So try sitting in one at your local storeroom before you buy if you are worried you may be too big. Provides a medium strength and deeply relaxing massage for your tight back muscles. The L-track system massages right from your neck to your hamstrings. Has 3 different forms of massage (airbag, roller and heat). And 6 Shiatsu massage based programs. The yoga stretching program is great for your back. You can customise the speed and intensity of the rollers and airbags. The body scanner matches the roller positions to your dimensions. Has 3 different zero gravity positions to relieve pressure. The foot rollers provide a reflexology treatment. The chair is only available in one colour. While the foot rollers can feel a bit too intense for some people. It's not suitable for very tall people or people over 220 lbs. All in all the Kahuna LM-6800 Yoga massage chair is fantastic value when compared to other chairs in this price range. As it's packed full of features that you'd only expect to see in much higher-priced models, such as an L-track system and foot rollers. And having this L-track system is especially great for your back, as you can get a massage right through to your glutes and hamstrings. While the yoga stretching program that comes with this chair will leave you and your back feeling fantastic. Now there are a couple of features that are not quite up to the other chairs here, which is to be expected at this price. But none of them are deal breakers in my opinion. 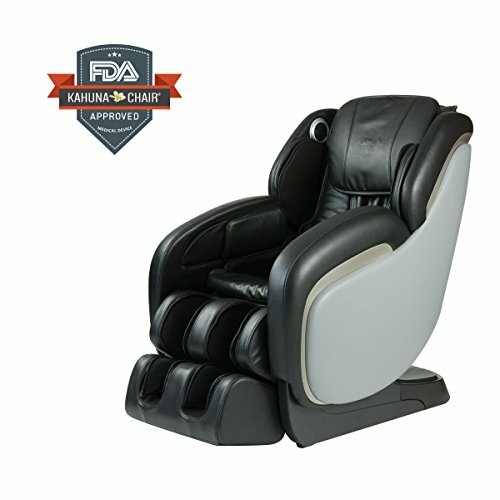 So while you won't get as strong a massage as you will in the other two chairs, the Kahuna LM-6800 is still capable of providing you with deep levels of comfort and relaxation. ​Which makes it a great chair for those on a budget. The amount of different options can be a bit overwhelming. Now if you've read up to now you may be starting to think about buying yourself a massage chair. 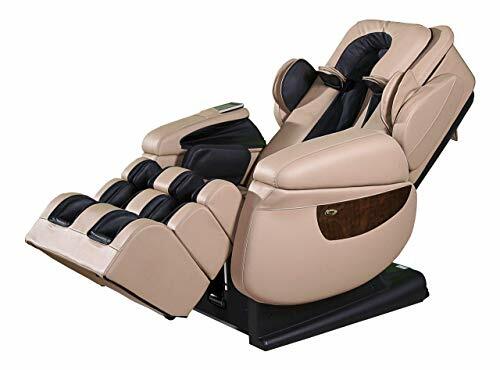 However, the problem is there are is much choice out there with massage chairs having slightly different functions that the whole process can be very confusing. And for such an expensive purchase you need to make sure you get it right. So use the following as a checklist to tick off when you're making your selection to ensure you end up with the best massage chair for you. Make sure you find a chair that fits you. When shopping for a massage chair you need to be clear about what you need it to do. Because if you're not then you could end up with one that just doesn't solve your problems. For instance, all massage chairs will have the option of giving a relaxing Swedish massage. But if you want your massage chair to be able to work out the muscle knots that are causing your back pain too then this might not be enough. So you need to get a massage chair that has the strength and intensity of massage needed to really get into your tight spots and make a difference. And the ones I've recommended in this article will do exactly that. Another thing to watch out for is the fit of the chair. As each chair will be slightly different and this will mean some will be more comfortable than others for you and your body shape. So once you have selected a couple of potential candidates take a trip to your local department store and try them out. As you'll soon be able to pick a winner after a spending a couple of minutes sat in each one. Then go home and order one online to save yourself some money (but don't tell them I said that!). Another way to ensure you get the right massage chair is to get one that comes with a free trial or money back guarantee period. With massage chairs this usually amounts to about 30 days, which is enough time for you to truly road test the chair and make sure it suits your needs. Now this isn't always the easiest thing to find. But there are some companies that do offer this (such as the makers of the Luraco iRobotics 7 massage chair). This will give you peace of mind when purchasing and means you have nothing to lose by ordering one and giving it a go. Just make sure to check that the money back guarantee is a no questions asked one and doesn't come with any conditions or small print. And confirm with the company whether you would be liable for any delivery, collection, or installation fees to avoid any nasty surprises. Because some companies even charge a restocking fee for returns that can be anywhere between 15-35% of the total cost of the chair! ​So returning the chair would just make no sense really which is a shame. And in those cases you need to be really confident that you've picked the right massage chair before committing to buying it. Buying a massage chair is a major purchase and one that should hopefully last you for many years to come. However, it's vital that you read the warranty before you buy and make sure you are covered for any repairs or faults that occur down the line. Because while these chairs are extremely well made and have a low failure rate they do contain a lot of mechanical, motorised, and computerised parts. Which means there is a chance that something will malfunction at some stage. So read the small print and make sure your warranty is long enough and that you are covered in this case. But if you buy from a reputable company and double check the warranty beforehand you'll have peace of mind and be fully covered further down the road should anything go wrong. Research the backside out of it before deciding on a massage chair. We are lucky in the age of the internet that so much information is available at the click of a mouse. So use it to fully research your preferred massage chair before buying it. As by educating yourself you can make a truly informed decision (and I hope this article can play a part in helping you in that process. Thanks for visiting by the way!). This way you'll know exactly which features are important to you and which you can do without. And also make use of the customer reviews on sites such as Amazon. As while some of these need to be taken with a pinch of salt, there is no better way to find out the good and bad points of a particular chair than from someone that has been using it for a few months. So do some digging, read a few reviews (both good and bad) and you should be able to gain a balanced overview of what the chair is actually like. 5. Keep The Missus Happy! Don't mess with her colour scheme! This probably should have been number 1 on the list. Because if you don't get this right you'll need more than a massage chair to solve your problems! Now as I mentioned previously massage chairs come in all shapes, sizes, colours, and materials. You also need to find one that fits into the room you are planning to use it in (both from a size and decoration point of view). So avoid the wrath of the missus and get one that isn't too big, doesn't overpower your current set-up, and blends in with what's already there. What Are The Downsides Of Using A Massage Chair? Don't sit in the same position for too long. In general massage chairs are pretty safe to use. As they offer a non-invasive form of treatment and you can adjust the strength and intensity of the massage to suit your own specific needs. However, there's one thing you need to take into consideration when using a massage chair. And that is to not sit down in one for too long. Because as these chairs are super comfy it can be easy to get so relaxed in one that you spend hours just sitting down and chilling out. And this is bad news for your back. Because sitting down for prolonged periods of time has been shown to lead to the development of lower back pain. So while it's great to sit down in a massage chair and allow yourself to relax, be mindful not to do it for too long each time. And instead take microbreaks from sitting by getting up every half an hour to walk around, stretch, and mobilise your body. This will get your blood flowing, keep your core muscles active, and decompress your spinal vertebrae. And by getting this balance right you can use your massage chair safely and productively and your back will reap the benefits. And Now The Big Question - Are They Worth The Money? You're going to need to raid your sack of cash to get a good quality massage chair. Let's be real here, massage chairs are bloody expensive! And the hefty price tags mark them out as a luxury item that may be a bit too much of an extravagance for most people. And I'd have to say I totally agree with that. As they are an extravagance rather than a necessity. Because you can get relief from your back pain without ever using a massage chair. For instance, there are many ways you can feel the benefits that massage chairs bring at a much lower cost such as using self-massage tools like foam rollers and acupressure mats. And staying active, stretching regularly, and keeping your body fit and strong can keep you loose and pain-free too. But while massage chairs aren't a necessity for dealing with back pain, they can still be a massive help. And they can also be extremely comforting. As just knowing you are going home after a hard days graft and can sit in your chair to massage away your aches and pains will give you peace of mind and something to look forward. And there's no doubt that these chairs help you to relax which is another vital component in keeping back pain at bay. You don't need a massage chair but do you want one? And would it be something that would make your life more pleasant? Does the thought of using one every night ​sound appealing to you? And do you want to see your neighbours and friends faces turn green with envy? If you answered yes to any of the above then a massage chair may be worthwhile investment. After all, sometimes it's not just what we need but what we want that makes us happy. I hope that after reading through this article you have a better idea of what massage chairs do and how they can benefit you. Because while they are expensive, they are also a great way to relax and soothe your tight and aching back muscles. And they can be a great addition to your daily pain management routine that could really keep back pain at bay. So check out the 3 chairs I've recommend here as they are great for people with back pain. And also have a shop around yourself to make sure you make the right choice. As it's a big investment but it's also one that could benefit your health and well-being for the next 10-15 years.